Unit 702 is a 1998 Pierce Lance Pumper/Tanker. Unit carries 2000 gallons of water, 55 gallon foam system, 2000 gpm pump and carries a crew of 5 with (4) 4500psi SCBA jump seats. 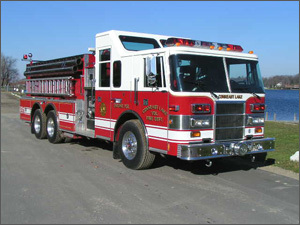 Unit is equipped with 1000gpm deck gun, 2-1/2 inch Blitz Fire portable deck gun, (4) 200ft 2 inch pre-connect attack lines and 1000ft 4 inch supply line. This is the first out on all structure fires.